Tashi Lhunpo Monastery UK Trust regularly organises tours by monks from the monastery to the UK and Europe. 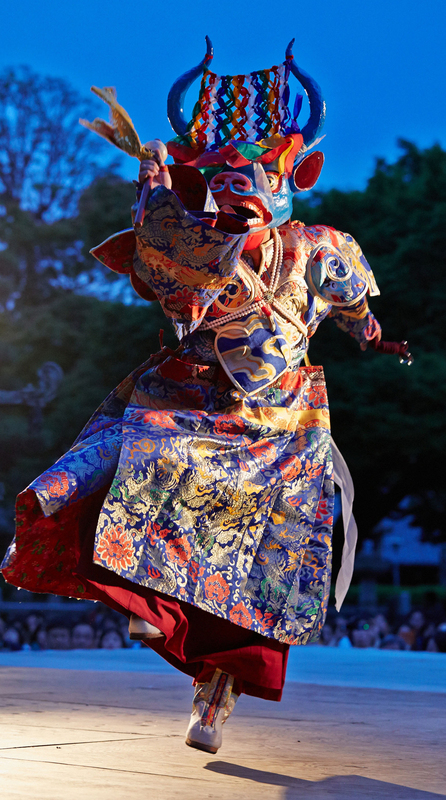 'The Power of Compassion' is a 90 minute performance of masked dance and sacred chant from a Tibetan monastery, offering an entertaining and informative introduction to Buddhist monastic ritual. The dramatic dances, taken from the Gutor Festival before Tibetan Losar (New Year), use colourful costumes and masks, and the instruments include the long horns, drums, cymbals and bells of the Tibetan Tantric orchestra, as well as the atmospheric calm of traditional chanting. The performance includes introductory explanations of each item in the programme which allows audiences to get more understanding of the presentation. The monks also offer interactive workshops covering the performance or hands-on activities of Tibetan art, which are suitable for all ages. We can supply a Teachers' Pack for schools with background information if required. The monks have performed in theatres, arts centres and village halls all over the UK and Europe, and have been in residence at a number of festivals including Glastonbury, Womad, Musicport and Larmer Tree amongst others (and even a guest appearance in Loxfest from The Archers alongside the Pet Shop Boys in 2014), where they have been a very popular addition to the programme. They have recorded a number of CDs, and have had their music broadcast on radio and television on many occasions. There is a link to their recent appearance on Radio 3 at http://www.bbc.co.uk/programmes/p028lh7g and recordings can be found at http://tashilhunpomonks.bandcamp.com/. Music from a recent CD forms part of the soundtrack of the Netflix film, 'Marco Polo', which was released in December 2014. Please contact us for more information, to enquire about availability, suggest a venue or request information about workshops, at info@tashi-lhunpo.org.uk. For details of our current tour, please click here.